Hours: Mon - Fri 10a.m. to 5p.m. The Automobile Club of Argentina runs a small museum on the second floor of their building on Av. Del Libertador. 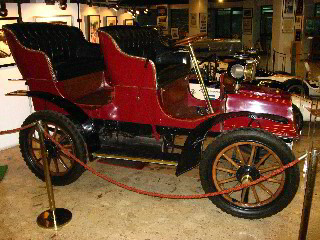 It holds classic cars, model cars and other objects important to the history of automobiles. It only takes a minute to see the collection of cars from the early 1900’s, and it is a great stop either to or from the National Museum of Fine Arts which is located just a few blocks east of the car museum on Av. Del Libertador. Some of the more significant models in the museum include a 1892 Daimler, 1902 Schacht, 1903 Peugeot, 1904 Darracq, 1908 Ford, and 1911 Renault. The first car you notice when walking into the museum is a 1904 Cadillac with shinning black leather interior and red doors. There is a small collection of race cars, a 1971 Brabham BT 36, a BWA and a 1970 Brabham BT 30; all proudly displaying ‘Argentina’ in bold lettering across the front. There is an American made 1924 Hudson, a German engineered 1911 Wandere, an Italian crafted 1908 Fiat and a 1912 Daimler from England. All of these vehicles are owned by the Argentina Automobile Club. The Automovil Club Argentina provides detailed street maps of the city, along with roadside assistance, hotel and camping information, and other information for tourists. Just like AAA being a member of the Argentina Auto Club gives you many discounts for various things in Argentina.